Congenital diaphragmatic hernia (hereinafter referred to as CDH) is a condition in which the infant is born with a hole in its diaphragm, which is a thin muscle membrane dividing the abdomen from the chest. The abdominal organs – the small intestine, large intestine, stomach, spleen and liver – push into the chest, putting pressure on the lungs. The resulting hypoplasia of the lung causes obstacles to breathing. Depending on the position and size of the hole, the symptoms may not cause any impediment, but many cases in which the hole is to the rear outside of the diaphragm are accompanied by severe, life-threatening symptoms immediately after birth. This is said to occur in around 1 in 2,500 live births. The diaphragm is formed around the 10th week of pregnancy, and due to the hole in the diaphragm, the stomach, intestines, spleen and, in some cases, the liver push into the chest, obstructing lung development. Between 85 and 90% of diaphragmatic holes occur on the left side. It is extremely rare for them to occur on both sides. Although CDH sometimes occurs on its own, it is said that in 30% of cases it is accompanied by chromosomal abnormalities and, in 40% of cases, by congenital heart disease. In addition, it can be accompanied by other syndromes and/or structural abnormalities. Diagnosis is reached via an ultrasound examination. A diagnosis is reached if the stomach, intestinal tract, liver or other abdominal organs can be seen within the chest. An ultrasound or MRI is used to evaluate the extent of hypoplasia of the lung, since the condition of the baby at birth depends on it. Additionally, since prognosis is significantly affected by the presence or otherwise of complications, an ultrasound is also used to examine other organs and chromosomal testing is carried out. Diagnosing CDH in utero allows the formation of an appropriate plan for the method, location and timing of delivery, facilitating a immediate response after birth, and making it possible to coordinate a structure by which treatment can be started more swiftly. If CDH is diagnosed prior to birth, the fetus will need to be delivered in a perinatal medical center, where treatment can be started immediately. It is preferable for the lungs to be as mature as possible, and as such, the condition should be managed carefully during pregnancy, especially where there is a prognosis for premature birth, in addition to monitoring for the presence or otherwise of polyhydramnios. In principle, vaginal birth is recommended; however, planned births are implemented in some cases in order to facilitate a smooth handover to a neonatal therapy team comprising neonatal physicians and surgeons. Oxygen supply to the fetus is maintained in utero by the placenta; however, after birth the lungs are not able to maintain a sufficient oxygen supply, because of the pulmonary hypoplasia. For this reason, the infant requires strict respiratory management using a respirator, etc., immediately after birth. If the baby’s condition is stable, surgery is carried out within a few days of its birth. Surgery involves replacing abdominal cavity organs that have risen up into the chest cavity to their original position, and repairing the hole to the diaphragm. Since the size of the lungs does not change immediately upon surgery, strict respiration management is required on an ongoing basis. 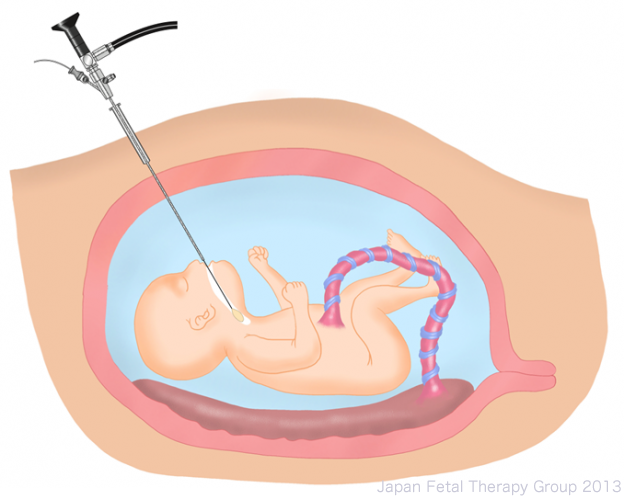 The main fetal therapy procedure for CDH at present is known as FETO (Fetoscopic Endoluminal Tracheal Occlusion), which positions a balloon in the trachea of the fetus using fetoscopy at around 30 weeks’ gestation. As a result of the procedure, the trachea is occluded and the alveolar fluid produced within the lungs themselves builds up in the lungs, promoting their expansion. The results of research published by a European fetal therapy group indicate that the application of FETO to fetuses with severe CDH has raised survival rates from between 10 and 40% to between 40 and 80%. We in the Japan Fetal Therapy Group are about to introduce this treatment method to Japan, in order to apply FETO to infants here with severe CDH. For further details, please see our Clinical Research page. A period of between a few weeks and a few months is required before infants with CDH no longer need a respirator or the administration of oxygen. The survival rate of infants who sufficiently recover to leave hospital is between 95 and 100%. Complications occurring along with CDH include chronic lung conditions, which require oxygen and drug therapy after leaving hospital, gastro-esophageal reflux, growth and development disorders, hearing disabilities, or the reoccurrence of diaphragmatic hernia due to the patch or sutures becoming dislodged. Infants with CDH often require long-term care. Ideally, follow-up should be provided by a team comprising pediatricians, nurses and other therapists (providing nutritional guidance, developmental support, respiratory therapy, etc.) The frequency with which the patient requires attendance in hospital depends on the extent of the baby’s concomitant conditions, but long-term, detailed follow-up can lead to a more positive prognosis.